Dhaka, 22 October, Abnews: Prime Minister Sheikh Hasina today sought vote from the young generation for Awami League in the upcoming elections to keep up the pace of development, terming them as the biggest strength of the country. “Bangladesh witnessed tremendous development in the last 10 years of the present government. We seek vote from the young generation who are our biggest strength to continue the country’s development spree,” she said. 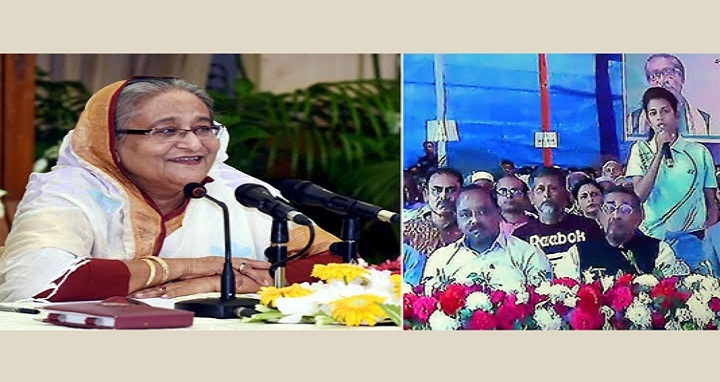 The prime minister said this while inaugurating 66 Sheikh Russel Mini Stadiums in 66 upazilas, youth training centres in six districts, a multi- sports indoor complex at Bangladesh Krira Shikkha Pratisthan (BKSP) and 73 youth and sports establishments in 38 districts through a videoconference from her official Ganabhaban residence this afternoon. Sheikh Hasina categorically said that there will be no hunger and poverty in the country if Awami League is voted to power again in the upcoming general elections. “If people cast their votes for Boat, the election symbol of Awami League and if we get the chance to serve the country through forming the government, I can tell you, without any hesitation, there’ll be no hunger and poverty by 2020,” she said. She mentioned that the government has been able to reduce the poverty to 21 percent and will be able to cut more in the coming days. Sheikh Hasina said the nation will celebrate the birth centenary of Father of the Nation Bangabandhu Sheikh Mujibur Rahman and the golden jubilee of our independence as a hunger and poverty-free country. “We’ll take the country forward further towards development … we’re working for overall uplift of the country including development of communication system,” she said. Besides, she said, the government always gives importance to the sports and youth development. The premier asked the youths to utilise their talents and thoughts for overall development of the country. “We hope they will make fresh thinking for the rapid development of the country,” she said. Noting that sports are closely related with education, the prime minister said the government is encouraging the youths in sports and games side by side with education so that they grow up with sound health and mind. She added: “This will also help the youths to refrain from stepping into wrong paths like terrorism, militancy and drugs. Sheikh Hasina said her government has undertaken all necessary plans for turning Bangladesh into a developed and prosperous country particularly keeping in mind the young generation. “The young generations would get all opportunities for flourishing their talents and thoughts for the beautiful future of the country, she said. In this regard, the prime minister said steps have been taken to establish Youth Development Centres in every area of the country from where youths would get training to be self employed. “They will also be able to stand on their own feet by taking collateral loans from the Karmoshangsthan Bank established by her government. The premier said Bangladesh witnessed remarkable development in all sectors including sports and games whenever her party Awami League came to power. She also elaborated the steps of her government for the development of country’s games and sports, including arrangement of various sports competitions and construction of many new modern and international stadiums in different parts of the country. As a result, Bangladesh advanced a lot in cricket, football, hockey and chess, she said and praised Bangladeshi female players for their success in various international tournaments. Sheikh Hasina vowed to establish a prosperous and developed Bangladesh by 2041 and said the government has taken farsighted Delta Plan-2100 for establishing Bangladesh as the most developed country in the world. Later, the prime minister exchanged views with the cross section of people including public representatives, students, teachers, government officials of Nilphamari, Mohammadpur of Magura, Barhatta of Netrokona and BKSP of Savar, Dhaka through videoconference. State Minister for Youth and Sports Dr Biren Shikdar joined the videoconference from Mohammadpur, Deputy Minister Arif Khan Joy spoke from Barhatta and the BKSP director general from BKSP, Savar.